Flame and smoke are seen during an Israeli airstrike in Gaza City, March 25, 2019. The U.N. Secretary-General appealed for calm Tuesday in the Gaza Strip, where Israeli war planes carried out airstrikes earlier in the day in response to continued rocket fire from the Palestinian territory. 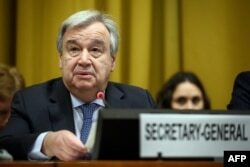 "First of all, we were clear in the condemnation of the rocket attack, but now we believe that it is absolutely necessary to avoid any scaling up and to have restraint," Antonio Guterres told reporters. "Our appeal is for restraint in the present moment, for the people not to suffer even more, both in Israel and in Gaza, and in Palestine in general." The militant group Hamas was behind Monday's rocket attack launched from the Gaza Strip, which the group controls. Seven people were injured in a house north of Tel Aviv. Israel responded with a series of airstrikes on dozens of targets across Gaza, including the office of the leader of Hamas. Five Palestinians were hurt in the strikes. Israeli Prime Minister Benjamin Netanyahu was in Washington on Monday when the violence erupted. He said during a meeting with President Donald Trump that "Israel will not tolerate this. I will not tolerate this." He said Israel "will do whatever we must do to defend our people and defend our state." Netanyahu cut short his trip to Washington and returned home to deal with the growing crisis. e is fighting for his political future and faces an uncertain re-election next month. Netanyahu has argued that he must remain in office to keep Israelis safe. He has been heavily criticized by supporters and opponents alike for what they contend is his ineffective policy of containing Gaza militants. On Tuesday, the U.N. Security Council held its regular monthly meeting on the situation. The 15 council members were briefed by the Special Coordinator for the Middle East peace process. 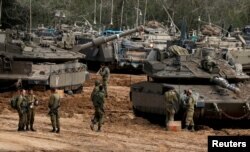 Israeli soldiers stand next to tanks and armoured personnel carriers (APC) near the border with Gaza, in southern Israel, March 26, 2019. "In the past 10 days, there have been two rocket attacks from Gaza targeting the Tel Aviv area, which represents a very serious escalation," Nickolay Mladenov told the council. "Since the early hours of yesterday, my team and I have been working intensely with Egypt and all concerned parties to ensure that the situation does not spiral out of control." He said in the past 24 hours, at least 103 rockets and mortars had been fired from Gaza toward Israel, while the Israeli Air Force conducted 42 strikes on various locations in Gaza. Tensions have been high since mid-March, as thousands of Palestinians have held mostly peaceful protests in the Hamas-controlled Gaza Strip against the deteriorating economic situation there. Hamas security personnel have used violence to disperse the protesters, including many women, children, journalists and human rights activists. Palestinian boys watch near the a Hamas site after it was targeted in an Israeli airstrike in Gaza, March 26, 2019. Palestinians are also restless ahead of the one-year anniversary of protests that saw more than 100 people killed by Israeli forces at Gaza's border fence. "I am concerned that we may once again be facing another dangerous escalation of violence in Gaza with potentially catastrophic consequences," Mladenov warned. "The last two days have shown us how precipitously close we are to the brink of war." Israel's U.N. ambassador said if the rocket attacks continue, "the Hamas leadership will feel the strength of the IDF [Israel Defense Forces] and be buried in the tunnels of Gaza." He urged the international community to condemn Hamas and recognize it as a terrorist organization. The United States and European Union have designated Hamas as a terrorist group, but many other countries, including Russia, have not.